While researching the museum’s collection of some 10,000 maritime photographs taken by Samuel J Hood, who worked in the first half of the 20th century, Nicole Cama encountered these stylish women portrayed during a Dutch naval visit to Sydney Harbour during the Great Depression. Subject initially thought to be Deetje Andriesse, her true identity was revealed after this article was published. All images Samuel J Hood studio, ANMM Collection. It’s 10 October 1930. The Great Depression has taken hold and Australia is faced with what Professor L F Giblin, later Commonwealth Statistician, terms ‘the menace of catastrophic unemployment’. It would reach 32% within two years. On this cool spring day at West Circular Quay, however, no such signs of economic turmoil are present on board the Royal Netherlands Navy’s HNLMS Java. Sydney’s fnest socialites have arrived for a fancy afternoon tea hosted by Dutch Rear Admiral C C Kayser, the Dutch Consul-General Petrus Ephrem Teppema and his wife Madame Carmen Teppema. Samuel J Hood, a well-known Sydney-based photojournalist, captures a spectacular parade of fox furs, cloche hats and frocks of crêpe de Chine worn by the wives and daughters of Sydney’s elite. But who are these fashionable ladies and why were they photographed? Visiting light cruiser of the Royal Netherlands Navy, HNLMS Java at Circular Quay in October 1930. Despite this mention of tough economic times, however, the accompanying lavish balls, luncheons, dinners and tea parties, according to the newspapers, showed ‘no evidence of depression’. The first official event held to honour the Dutch visitors was a musicale at the Royal Sydney Golf Club in Rose Bay. Consul-General and Madame Teppema greeted guests in the drawing-room, which was ‘decorated with clusters of poppies and bowls of primroses’. The next event was held on the Royal Packet Navigation Company’s SS Nieuw Holland; with its ‘coloured electric lights’, decorative fags and ‘trails of red and orange flowers’, it provided the ‘perfect setting’ and lit up Circular Quay. The following evening, the newly appointed Governor of New South Wales Sir Philip Game and his wife Lady Gwendolen Game hosted a ball. It was reportedly ‘the most brilliant seen at Government House for several years’, with ‘food lights in bright green and soft pink’ illuminating the building’s façade and Royal Botanic Gardens, and flowers of all varieties adorning the hallways and function rooms. Finally, the scene switches to the event captured in Hood’s photographs – afternoon tea with the Dutch Rear Admiral aboard Java. An orchestra played while guests were greeted on the quarterdeck by the Rear Admiral and the Teppemas. The younger guests danced throughout the afternoon on the upper deck, and tea was served in ‘buffet fashion’ with sumptuous Dutch cakes and biscuits. This was followed by ‘one of the largest dances of the season’ on board HMAS Australia hosted by the Royal Australian Navy’s Rear Admiral, Edward R G R Evans. 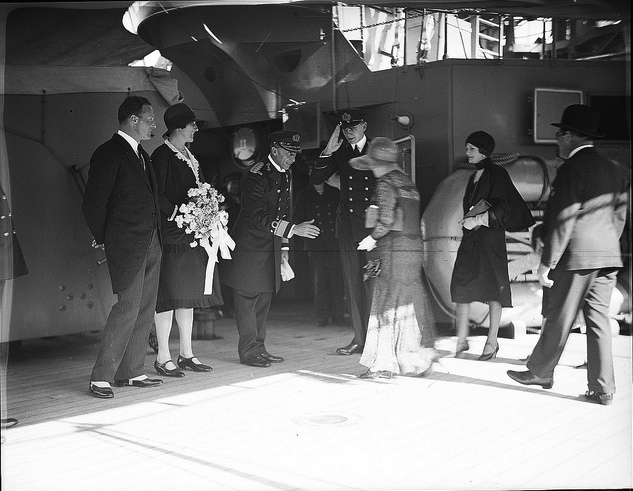 Dutch Consul-General Petrus Ephrem Teppema and wife Carmen in receiving line next to Dutch Rear Admiral Kayser. Those he’s greeting are possibly Lady Annie Riddle, wife of Sir Ernest Cooper Riddle, Governor of the Commonwealth Bank of Australia, and daughter Miss Enid Riddle. Pomp and ceremony were the way of things at these events, but media attention was focused on the female guests. Naval balls were hosted as a symbolic diplomatic gesture; however, they provided the opportunity for members of the ‘younger set’ (debutantes and single women) to represent their family’s name in style. The guest list featured the Lady Mayoress Hilda Marks, sister of Sydney’s Lord Mayor; Mrs Elsa Evans, wife of an RAN Rear Admiral; Mrs Hannah Lloyd Jones, wife of Charles Lloyd Jones, heir to the David Jones empire; and Madam Carmen Teppema, a former professional violinist whose father was the mining magnate Guillaume D Delprat. Most of them are pictured in the accompanying photographs by Sam Hood. Against this backdrop of politics and diplomacy, these women showed of the latest developments in 1930s fashion. They displayed what newspapers termed a shift in fashion ‘consciousness’, with a move from the ‘mannish’ styles of the 1920s to ‘modern’ trends, which favoured ‘the slender figure’ and a more feminine mode of dress. Hilda Marks, an ‘essentially feminine woman of culture’ with a penchant for Bohemianism, tobacco and shingled hair, wore a green printed crêpe de Chine frock and a beige Baku hat. 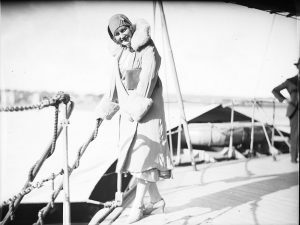 Mrs Elsa Evans, who was known as ‘the belle of Christiania’ before she was whisked away by her husband from her ‘Northern fairyland’ of Norway, ‘was most attractive in a honey wool crêpe de Chine ensemble, trimmed with honey-coloured fur, and a small beige hat’. Hannah Lloyd Jones, whose home in Woollahra was a popular setting for social events until the 1970s, wore a chiffon frock with art deco jewellery and fox fur. Carmen Teppema wore ‘a shady black Baku’, ‘a black morocain, which had an ivory jabot’ and held a bouquet of pink carnations as she greeted her guests. Against this backdrop of politics and diplomacy, these women showed of the latest developments in 1930s fashion. Though dignitaries from Japan, Norway and Italy attended, it was their wives who claimed the spotlight. Who wanted to know about the diplomats when Italy’s Donna Grossardi wore black printed silk and Madame Fay of Norway ‘was the last word in smartness in a black fat crepe suit’? From the younger set, Miss Deetje Andriesse wore ‘ivory embroidered romaine, which was tight-fitting, and had a skirt flaring from the knees’ with ‘a big natural straw’ hat. 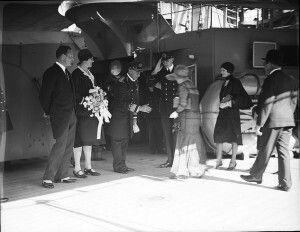 Miss Nancy Bavin, one of the ‘Premier’s pretty daughters’, ‘was in orange and white printed chiffon with a natural-toned Baku hat’. Miss Pat Baird ‘was smart in a bottle green moire frock, which had a double fared skirt and a flowing cape’ and Miss Anne Jamieson ‘looked delightfully cool in a green and fawn printed crêpe de Chine suit and a small fawn straw’. These fashion-focused articles appeared in sections designed exclusively for female eyes. The column ‘Jottings of the Week’ in The Australian Women’s Weekly (AWW) was brought to readers by a masked woman under the alias of Miss Midnight. Some newspapers explicitly demonstrated their exclusivity with daily social sightings, featuring in the SMH and The Sydney Mail under sections titled ‘For Women’, ‘Women’s World’ and ‘Feminine Topics’. These sections presented tailored topics for those concerned about anything from household management to baby welfare and physical culture. 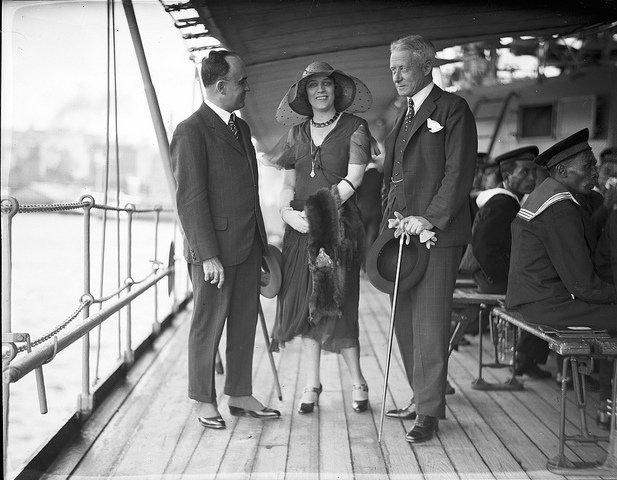 Mrs Hannah Lloyd Jones, centre, on board HNLMS Java with her husband, Charles Lloyd Jones, right. These articles reflect a time of cultural and social change in the way women were perceived. Though a woman remained an object of fascination, her presence in the newspaper illustrated a fixation not just on her clothing but her sense of style. Young women like Pat Baird, Nancy Bavin and Deetje Andriesse were socially designated arbiters of taste. These articles also reiterated a cult of youth rather different from our own, the sense that there existed only a brief window of opportunity to make an impression and become an established part of Sydney’s ‘social set’. This is demonstrated by the fact that Deetje, Pat and Nancy all carved their own niche after their debuts and went on to pursue their own callings. Deetje graced the art world as one of the most fashionable among the younger set, was painted by the famous artist Thea Proctor, went abroad to study and came back an accessories designer. Pat Baird was one of Sydney’s amateur actresses, was engaged by 1932 and received the Queen during her 1954 Royal tour. Reports of Nancy Bavin’s social outings became commonplace. 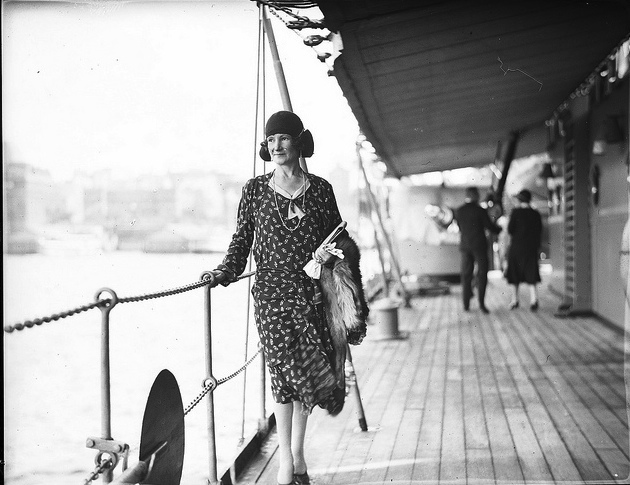 In 1929, she caused a stir and introduced a ‘new and charming fashion’ to Sydney, when she made her debut at a naval ball with a ‘tiny black cat pasted on her right cheek’. She would go on to publish ‘two columns of her facetiousness’ in London’s Punch magazine, was ‘captured by some big, bad wolf of an Englishman!’, actually Scottish, and ran a school in Surrey for over 40 years. They became poster girls for lavish events, particularly those hosted on naval vessels, as newspapers maintained that nautical occasions appealed to the ‘feminine heart’. In addition to stories of romance and fashion, social reporting revealed a tendency to veer away from the dismal economic reality of the Depression and create an uplifting, fantasy-like alternative. Lydia Gill wrote about her experience as a young woman in her book, My Town: Sydney in the 1930s, published in 1993. Gill recalled the large amounts of time spent looking and rarely buying, and when a social event did come along, she was often forced to borrow items in that all-important 1930s fabric-of-choice, crêpe de Chine. This ‘was a time for home sewing and good dressmakers’ and women did what they could to get by during a period known simply as Depression. In reality, these high-fashion narratives did not represent the experience of most Sydney women, but perhaps ‘the silken swish of taffeta and satin’ was what fascinated audiences. The social-pages provided the means for readers to live vicariously. They communicated an elaborate escapist fantasy and positioned it among advertisements selling not just a fashion trend, but an idea of the ‘modern woman’, free from the economic constraints of the Depression. As Lydia Gill mentions, people ‘did not advertise adversity’ and there was still a sense that, though times were rough, every special occasion called for a ‘spray’ or bouquet of flowers and the necessity for your frock to match your hat. Mrs Elsa Evans, formerly a Norwegian belle and now married to RAN Rear Admiral Edward Evans, formerly 2nd-in-charge of Scott’s Antarctic expedition. She is wearing fur-trimmed, honey wool crêpe de Chine. Dress essentially was, as it still is, a form of individual expression. Clothes then as now defined people, and a woman’s status as a trendsetter was contingent on the way she wore her clothing. These articles and photographs are from a time when fashion excess, such as fox furs and ostrich feathers, were considered the hallmark of sophistication and no item of clothing demonstrated individuality better than the hat. All kinds of hats, from Baku, toque, cloche to Balibuntal, appeared in these articles as the essential item of clothing. On another page appears ‘Fashion’s Latest Idea’, an article on the shoulder cape which had many devotees, with an accompanying image of three seated women all wearing a cape over their frock and an obligatory straw Baku hat. This uniformity has made positively identifying the women in Hood’s photographs an enormous challenge. This was not just because there were so few clear images published but because the descriptions contained in these newspaper reports, though specific down to the type of fabric a woman wore, focussed on outfits that were inherently generic and paid little attention to a woman’s distinct physical characteristics. Samuel Hood’s photographs of the various ships and boats that plied Sydney Harbour have appeared often enough in Signals and elsewhere. 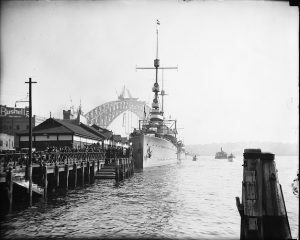 Sydney Cove was often abuzz with activity and excitement, with people drawn by the constant stream of ferries, merchant ships and naval vessels berthing at Circular Quay. 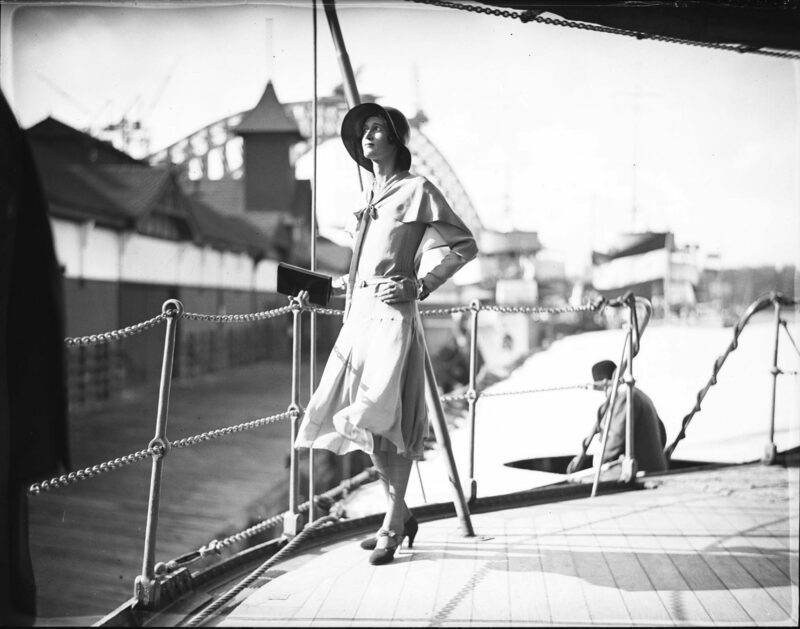 But magnificent as Hood’s ship portraits are, his fine fashion portraits offer a glimpse into another aspect of Sydney’s maritime history. These portraits add a human element to an event that previously only existed in newspaper print. Eighty-two years on, through painstaking research and detailed physical descriptions, we can now put names to these faces and investigate their stories. Mrs Donna Adelaide Grossardi, wife of Italian Consul-General Antonio Grossardi. Atmosphere is a term that is often used but is not always present in a photograph; the Hood photographs reproduced here, however, convey atmosphere beautifully. He captured elements of the visit and the people who attended the social events in ways that are rarely seen in early photography. When he snapped the Harbour Bridge he placed people and maritime events within the scene, creating a sense that the harbour really was the lifeblood of the city. These images reflect a flamboyance that was so characteristic of the time. At the very least, it confirms current romanticised perceptions of what the late 1920s represented: freedom, vitality, lavishness and an inevitable postwar high which followed what the Governor’s wife Lady Game had termed the ‘black cloud of horror’. 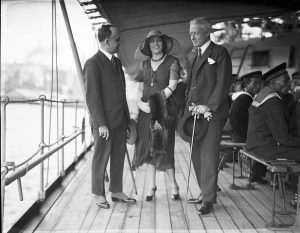 Each woman, though connected to an important male figure, cultivated her own persona and represented what was seen as Sydney’s elite. Their presentation to the press was carefully considered and orchestrated, and they were often listed and ranked according to their husband’s or family’s political status. They became poster girls for lavish events, particularly those hosted on naval vessels, as newspapers maintained that nautical occasions appealed to the ‘feminine heart’. With each thread, bead and sequin, the women on Java added a touch of glamour. NOTE: This story was originally published in Signals magazine, Issue 100, Sep-Nov 2012, pp 24-29. Reproduced courtesy of the Australian National Maritime Museum.